Anyone with an interest in cooking food that’s both satisfying and healthy will already know that lentils are a great addition to their diet. They’re nutritious – an excellent source of protein, as well as several important minerals, Vitamin B1 and iron. They’re also high in dietary fibre and low in fat. Good, eh? But it gets even better. 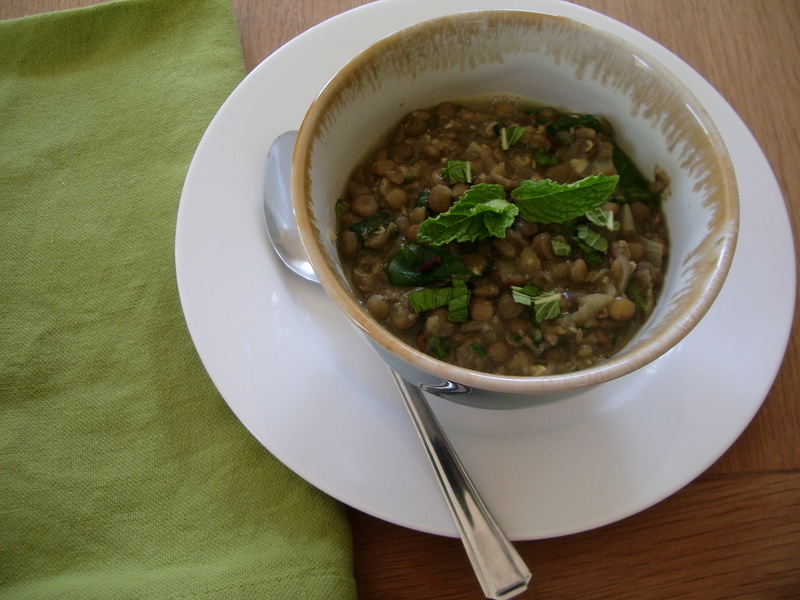 Lentils are versatile. And they’re cheap. They’re also quick. They don’t need to be soaked before cooking, although most have a hard seed that must be cooked before they’re edible. 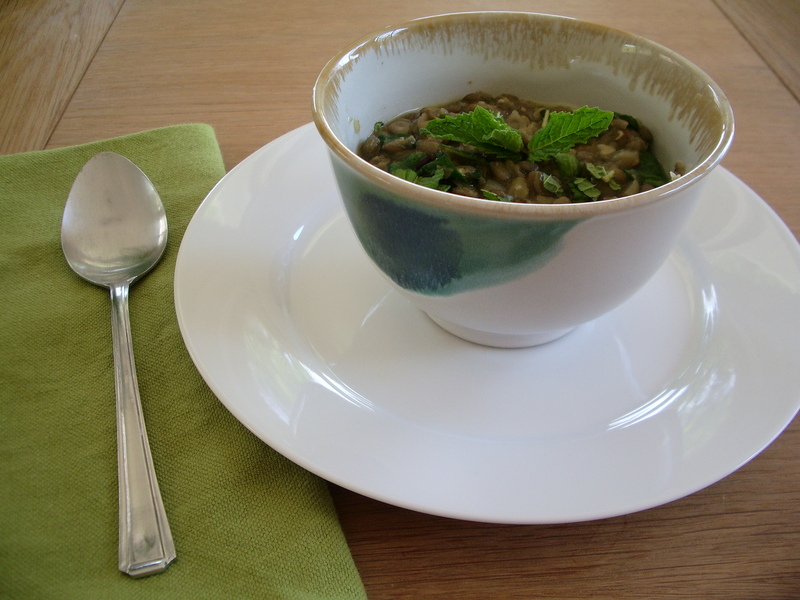 Green lentils – such as those used for this recipe – should be simmered gently (with a lid almost covering the pan) until the desired tenderness is reached. For use in salads that’s probably about 20 minutes, while 30 minutes should be appropriate for most other dishes. If you cook lentils for too long, then they quickly turn to purée, although green lentils do hold their shape much better than red lentils which are fabulous when allowed to collapse into dhals and stews. 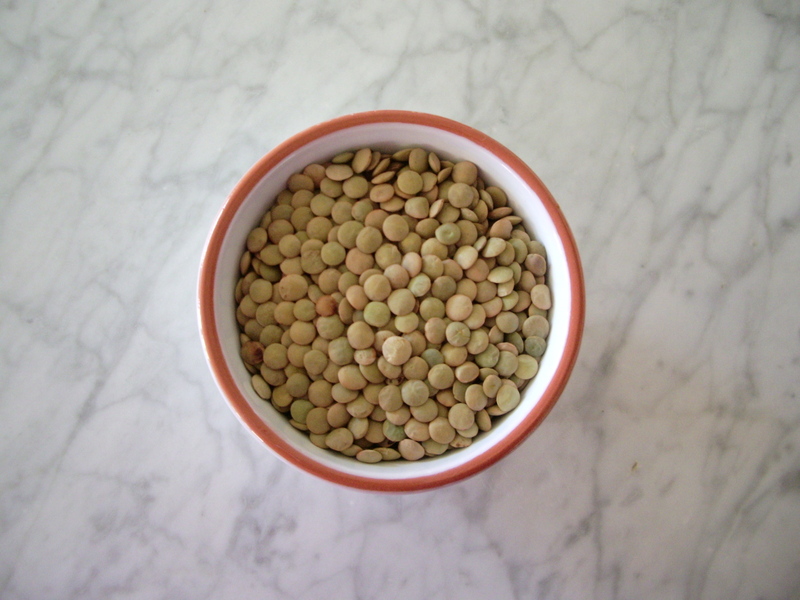 But despite the obvious benefits of lentils – and their popularity amongst those already familiar with them – there still seems to be a problem in convincing anyone who doesn’t already eat them to start doing so. With that in mind, I’m hoping that the combination of flavours in this particular dish (which contains almost every ingredient that is known to work particularly well with lentils – from parsley to pork), might just be enough to tempt someone who doesn’t normally cook with lentils (and who isn’t a vegetarian), to do so. The combination of lentils with meat and vegetables to produce a satisfying meal has a long tradition, and the all-important ingredient here is bacon. Using a relatively small amount adds little in the way of either cost or animal fat, but it does – along with the onion and garlic – provide an incredible base for this wholesome soup. Don’t under-estimate how good the spinach tastes in this too, and it’s vital not to skimp on the lemon or mint, both of which are added in the final stages of preparation and which really do help to make this irresistible. Peel and finely chop the onion, then cook over a moderate to low heat with a little olive oil, the sliced garlic and the diced bacon. It should be golden and fragrant. Chop the parsley and stir it in. Wash the lentils thoroughly, and stir into the onions and bacon. Pour in the stock and bring to the boil, skimming off any froth that comes to the surface. Add the bay leaves if you fancy. Turn the heat down so that the lentils continue to simmer, then almost cover the pot with a lid and leave until they are tender – but don’t let them collapse – which will probably take about 30 minutes. Wash the spinach thoroughly, and while it’s still wet and dripping, put it into a shallow pan over a high heat and place a tight-fitting lid on top – the spinach needs to cook in its own steam. Lift it out, squeeze it dry, then divide it between four warm bowls. Season the soup with salt, pepper, lemon juice and the torn mint leaves, tasting as you go. Ladle the hot soup on top of the spinach and serve with more lemon and mint for anyone who wants it. 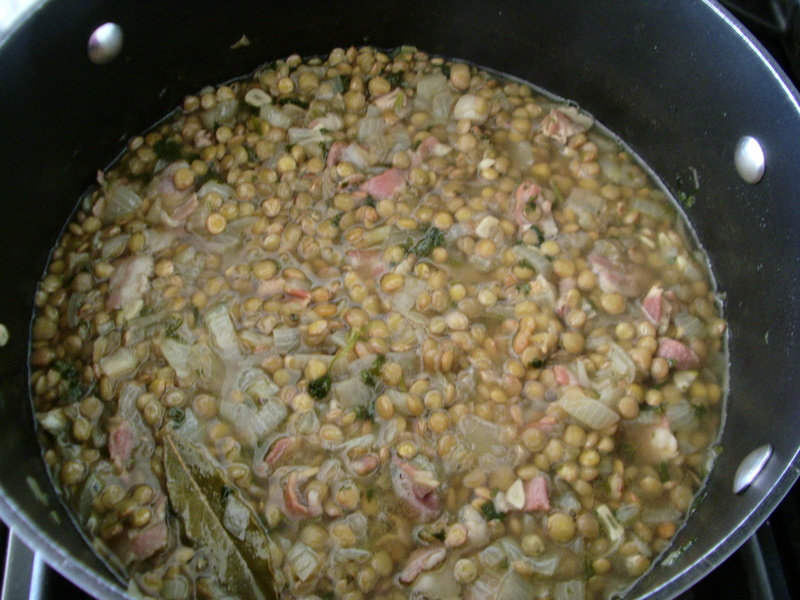 This entry was posted in Food, Lunch, Nutrition, Recipes, Soup, Starter and tagged bacon, Green lentils, lentil and bacon soup, Lentils. Bookmark the permalink. Looks great, that’s my kind of soup, and very nicely presented! 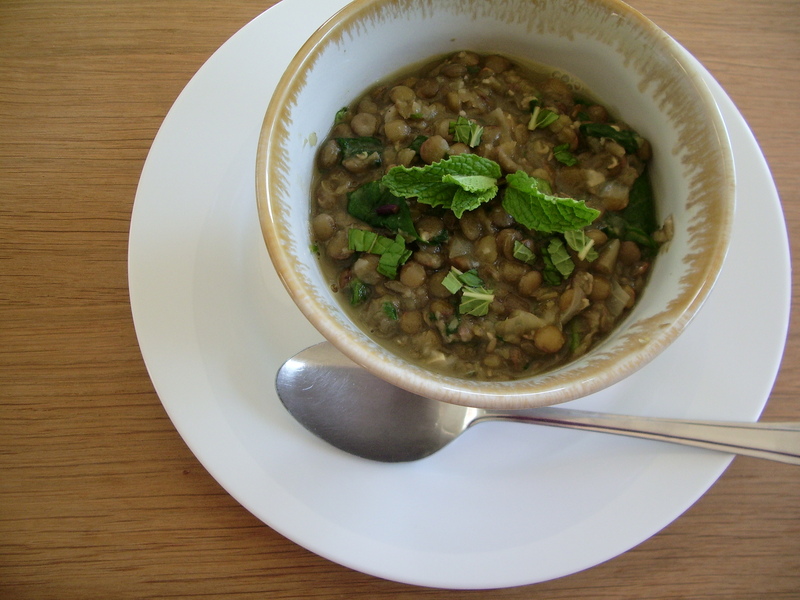 I’m very much in to cooking with lentils at the moment especially in slow cooked dishes. So healthy and yet so much more flavour than other accompaniments like potato or rice. Thanks Phil! Lentils are great, aren’t they! I definitely prefer them to potatoes and pasta, and they really do seem to take on the flavour of what ever it is that you’re cooking them with. Lovely pictures and the recipe sounds delightful. 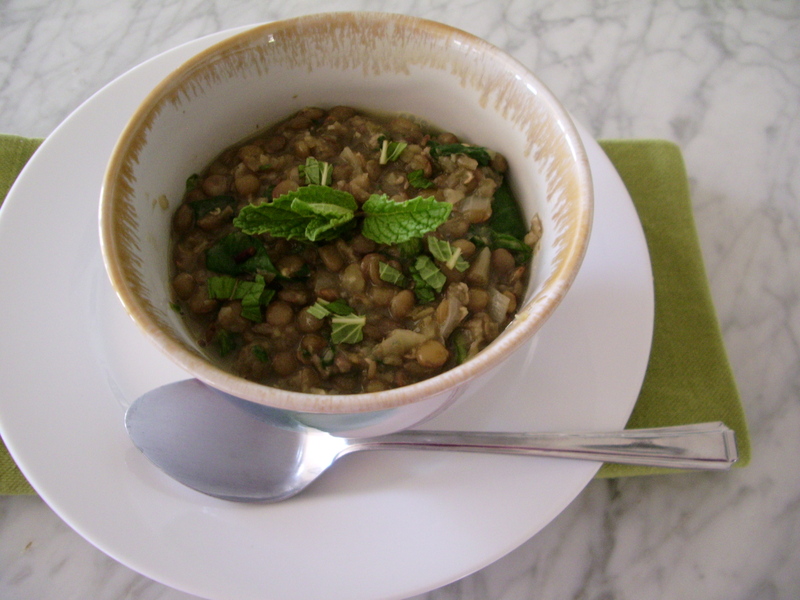 I;m already a lentil fan now I can add this recipe to my list. Thanks Sue. I think you’ll enjoy this – and if you do try it, let me know what you think.